Throughout the year, SFP hosts Spring and Fall Raffles with proceeds funding programs for children and families. 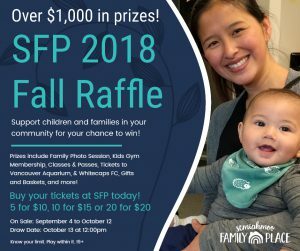 Thank you to everyone who supported the SFP 2018 Fall Raffle! 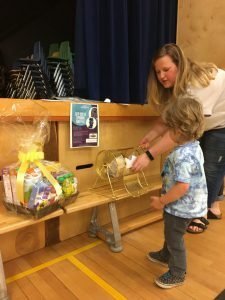 Nearly 400 tickets were sold, and more than $500 raised to help provide local children and families with a safe and welcoming place to connect through play. Tickets were sold from September 4 to October 12, and the draw took place on Saturday, October 3 at noon. This fundraising effort wouldn’t be possible without the involvement of our generous prize donors, so please join us in recognizing their commitment to supporting their community. Family Mini Photo Session from GAO Photography – Ticket #031, Camila D.
Kids Gym Membership and one month of classes from MyGym – Ticket #063, Katie M.
Four Passes from the Vancouver Aquarium – Ticket #717, Berkley M.
$100 Gift Card from The Keg Steakhouse & Bar – Ticket #206, Roselyn F.
Two Tickets from the Whitecaps FC – Ticket #597, Sachiyo A. 12 Adult & 12 Child/Youth Recreation Passes from the City of Surrey – Ticket #244, Rochelle D.
Gift Basket from The Modern General – Ticket #555, Jamie H.
$50 Gift Card from Tap Restaurant – Ticket #675, Stacey & Tara J. 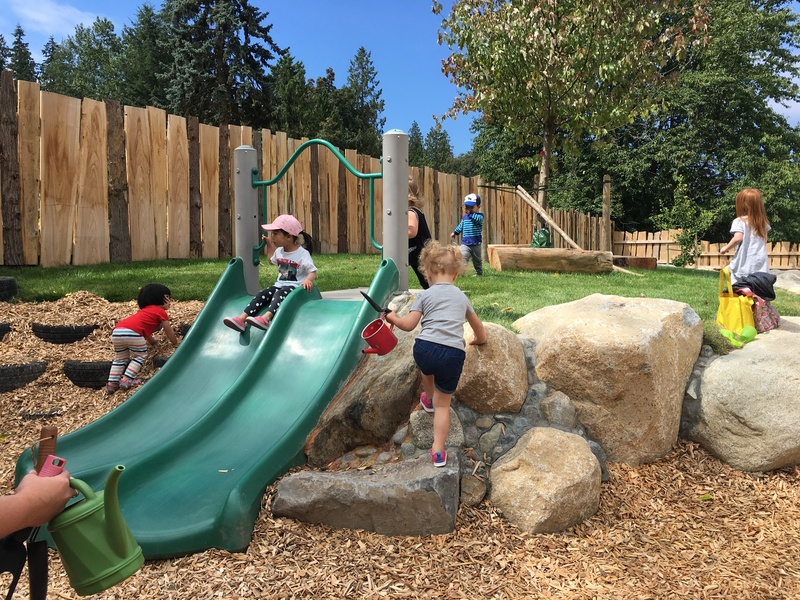 Two Play Passes from We Play Kids Gym – Ticket #031, Camila D.
$25 Gift Card from Joyful Indulgence – Ticket #708, Berkley M.
All funds raised help support local children and families connect through play in a safe, respectful, family-centred environment. SFP is a non-profit organization made possible through grants, our community partners and prize donors, and the generous support of people like you. Thank you! SFP is especially grateful to everyone who purchased any of the 191 tickets sold from May 1-31st. More than $200 was raised and all proceeds will go towards operating expenses including rent, staffing, and supplies. Also, a special thank you goes to our volunteer Niko, who selected the winning ticket at the draw, held on June 2, 2018.